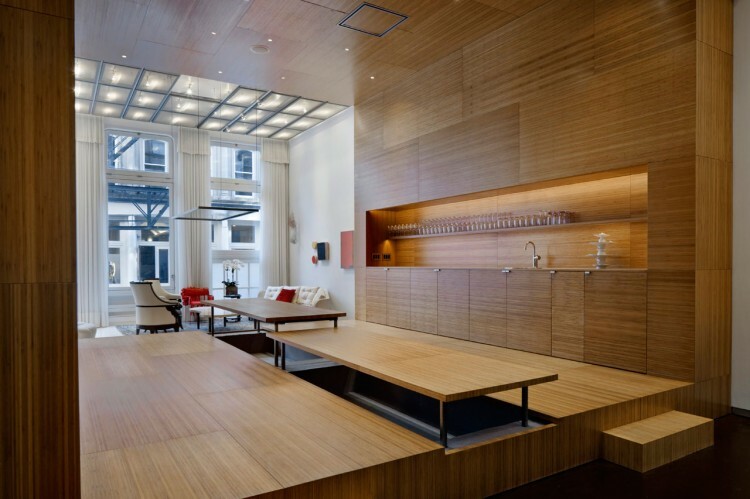 New York City-based archtectural firm WORKac has recently completed this 6,000 square foot loft apartment in the Big Apple. 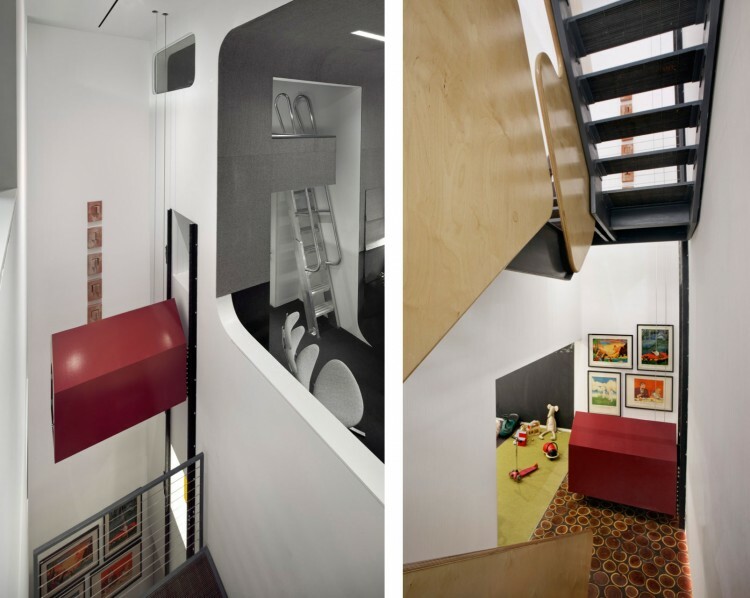 Designed for a family of four that “loves to entertain”, this “inverse triplex” is the result of four years of collaboration between the architects and the owners to create a unique space for urban living. 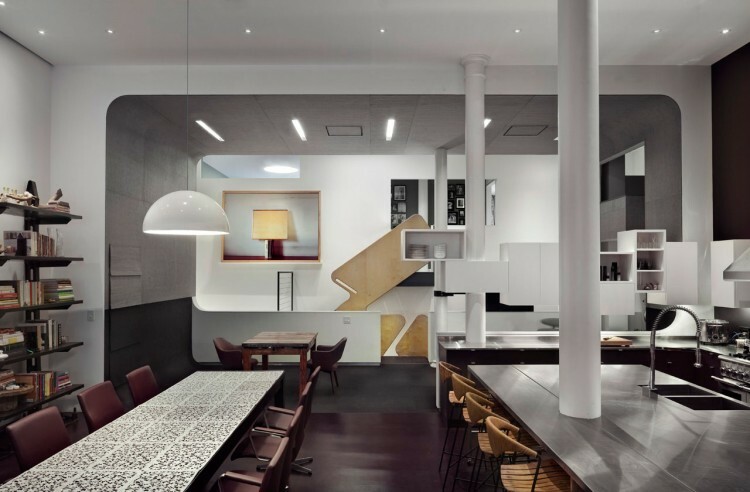 “WORKac has recently completed its most ambitious interior to date – a 6,000 SF loft apartment that encompasses a full ground floor, half a basement and one third of a sub-basement: an “inverse triplex” for a family of four that loves to entertain. 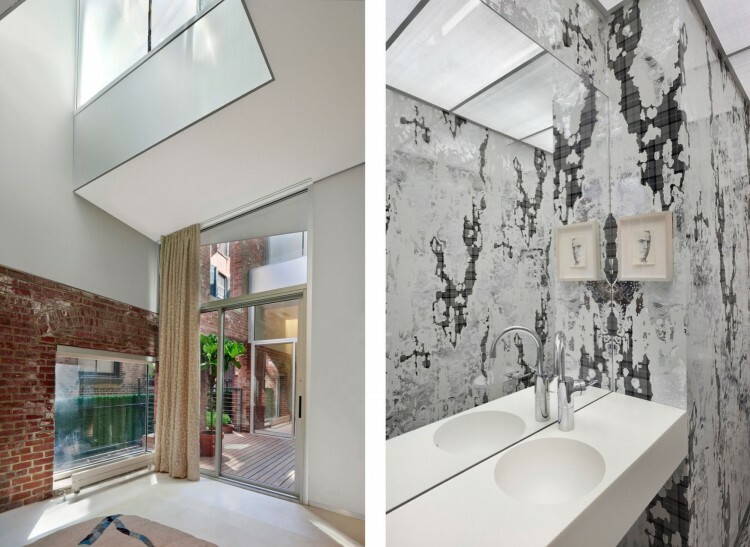 For more than four years, WORKac has collaborated with the family to create a new space for urban living that embraces diversity of materials and spaces, kinetic interventions to transform spaces and a highly developed sense of whimsy and the unexpected. 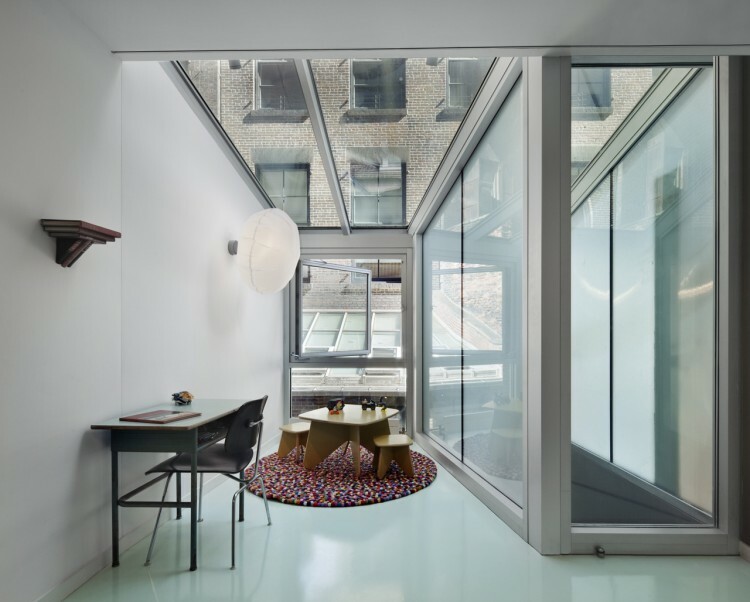 The classic New York minimalist loft was considered too constraining and inflexible. 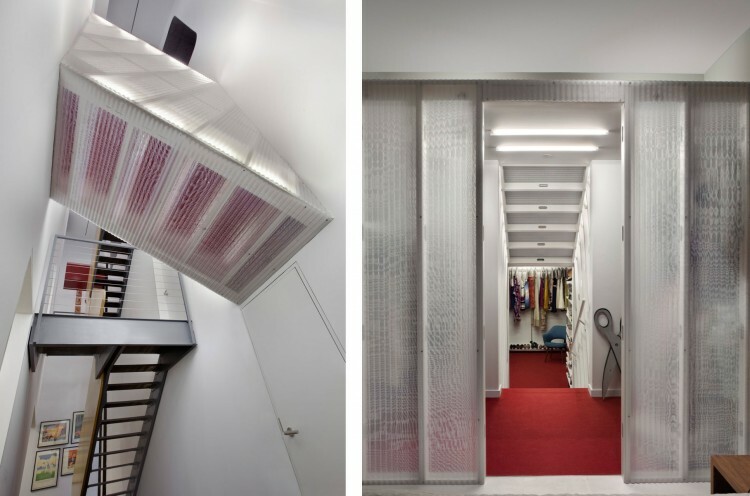 The concept therefore was to divide the space into a series of programmatic “stripes” to accommodate different functions, moods and materials and break down the length of the apartment into a promenade of experiences, from most public at the front to most private in the back. This is combined with a shifting of the rear floors to allow for three full-height levels. The stripes consist of: the Living Room at the front of the apartment, with white resin floors and a loft-lke minimalist feel; the bamboo Shaker Box which has built-in storage and Japanese-style tables set in the floor – it can double as a stage or dance floor; the Kitchen/Dining room with plum-colored concrete floors and walls and a more formal arrangement of a table for 12 to 16 and an enormous kitchen; the Media Room where curved felt-covered walls, floor and ceiling provide a comfy nook for hanging out – a kids-only sleeping loft above provides space for sleep-overs. The Void is an indoor light shaft with a mesquite-tiled floor that accommodates the circulation as well as a “Stitchevator” (named after the family dog) carrying tired dogs, snacks or toys between levels and a translucent bridge connecting the Master to a megacloset behind; the Bedrooms zone contains two kids rooms at the top, Master at the basement level and Nanny and Guestroom at the bottom; the Skylight strip employs a number devices (glass, voids, an outdoor courtyard) to distribute light among all of the levels; the rear Garden is a small stripe of green – and chicken coop. 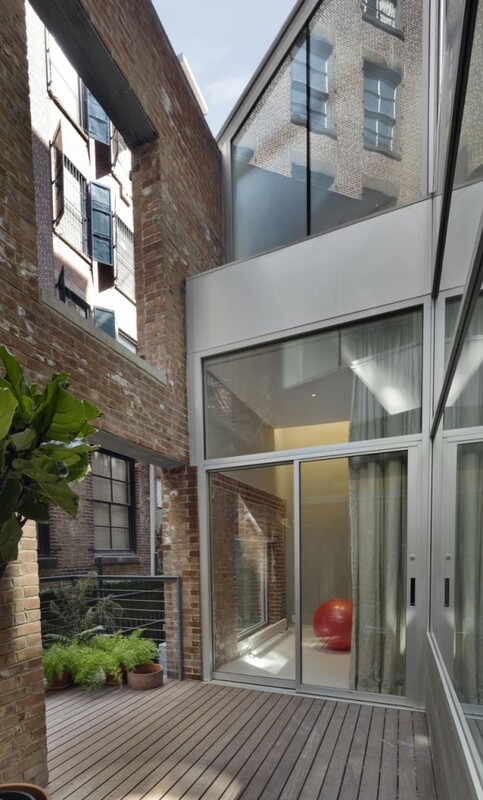 yea…if i was rich my place would look this cool too…and id be able to take the pix on my expensive camera.